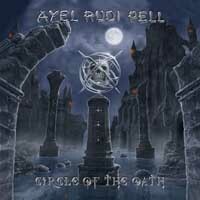 After thirteen albums in his own name and some discs with the awesome band Steeler, the German veteran Axel Rudi Pell can only be considered to be an institution in the Power Metal genre. He stands for something genuine and solid in the PM genre and on this disc it's sounds exactly like what you would expect from ARP. His guitar riffs and hooks are just as potent as expected and with the power pack vocalist Johnny Gioeli (Hardline) at the mic, it's a metal for almost an hour. The most obvious difference from the earlier albums is the lyrics. No more dragons, swords, or castles. Now it's more mature and seriousness in the subjects. Good or bad?? I don't know, but it's different anyhow. It all starts off great with a up-tempo track in 'Ghost in the Black' with catchy guitars and a massive vocal performance from Gioelli. Tracks 2 to 4 are all mid-tempo songs in the middle class with nothing surprising or anything outside the expectation box anyway. The title track (best one on the album) is a power ballad in the super-heavy-weight class. Heavy drums from Mike Terrana and insertion of acoustic guitars in between bring awesome breaks to the song and with oriental influences, which changes the patterns. In 'Fortunes of War' ARP's guitars are the most prominent. 'Bridges to Nowhere' is ballad no 2 on the album and is another power track with depth and seriousness in the lyrics that gives it a heavier message and that lifts the tune. Next tune (Lived Our Lives Before) is also a ballad, but in the lighter division and it doesn't have the power as the earlier ones. Felt a bit old and had more chewy fudge sense to it. With razor-sharp guitars with a bit of melodic rock in the power metal mixture makes a consistency that I like in 'Hold on to your Dreams'. The more than 9 minutes long closing epic track "World of Confusion (The Masquerade Ball Pt. II)" it all ends in a great way. If you like 'The Crest' or the albums in the Ballad series you surely gonna love this one too. A must buy for the ARP fans. Axel Rudi Pell - Guitars, Johnny Gioeli - Vocals, Ferdy Doernberg - Keyboards, Volker Krawczak - Bass, Mike Terrana - Drums.